An important part of your success as an instructor is based on the books and other materials you select for students to use as part of your course. Good textbooks and online readings can help students be both better prepared for class and provide some of the instruction. Barnes & Noble and Follett are two of the companies that operate many college bookstores. As of March 2018, Barnes & Noble College operated bookstores on more than 780 campuses in the US. Selecting a weak textbook or requiring too many textbooks can lead to students being overwhelmed which can be reflected in the students’ participation in class, academic performance, and the evaluations they give you at the end of the semester. Let me offer ten tips for selecting textbooks and other course materials (i.e., online readings, textbook online resources). Does the book provide foundation information for the course? Will the book provide assignments, exercises, labs, or case studies for student practice or assessment? Does the book provide a point of view or different points of view that contribute to a broader understanding of issues involved in the course? The more than 400 new teaching assistants at the University of Florida have been busy preparing for the start of school by attending the New Teaching Assistant Orientation. I enjoyed being part of the team of faculty members, administrators and teaching assistants who made presentations for the orientation. What activities can you use to learn student names? What are tips for international teaching assistants for whom English is not their first language? What advice do you have for how to avoid discipline problems that can be caused by cellphones? Preparing for the presentation is always helpful for me, as talking about planning for teaching success helps me in my own class planning. Thanks to Drs. Paul Duncan, Winifred Cooke and Rhonda Moraca for coordinating such a helpful program. For more information on support for teaching assistants (including the “Teaching at the University of Florida” handbook), check the UF Teaching Center. Think about how you can get your students more actively engaged in class. Peer work can be a way of helping students better understand course content. Here students in a writing course I teach, provide feedback on a writing assignment. Colleges and universities around the country will be starting a new academic year in the next few weeks. Students and their parents will be arriving on campus with carloads of boxes to move into residence halls. Campus maintenance crews are preparing the grounds, and construction teams are trying to finish campus remodeling and building projects. And faculty, adjuncts and graduate students are planning their classes. Now’s the time to do some thinking that can improve the course — making it a better learning experience for your students and a better teaching experience for you. Salman Khan, in his One World Schoolhouse: Education Reimagined, reminds us as educators that students become more engaged in learning when they see the value of the course beyond preparing for an exam or completing a graduation requirement. Especially if you are teaching an introductory course, help the students connect with the value of that subject area. Your approach to the course could help some students decide to take more courses — or even major — in the field. For the other students, they will have a better understanding of the concepts as they connect to life issues. Especially the first time you teach a course and especially for new faculty members, the tendency is to select a good textbook and then structure the course to match the textbook chapters. Start first with what the Student Learning Outcomes are for the course – which you may be determining but also may be determined by the overall curriculum structure. In Understanding by Design, Grant P. Wiggins and Jay McTighe explain the process for mapping out a course — starting first with the student outcomes and then designing appropriate activities and assignments. The major project for Mass Communication Teaching (MMC 6930) is developing materials for an undergraduate communications course. We’ve been working on that project since the second week of class when you met with me to discuss the course you were considering and how developing that course would fit with your teaching goals. You’ll be turning in your syllabus – paper version – in class on Oct. 29. By the end of class, you will be posting at least a portion of your syllabus on your online portfolio. Proposal for course – You turned in your proposal on Sept. 17. Revise that proposal to reflect any changes you’ve made to the course, such as including prerequisites, and to add references to the syllabi you used for developing the course. 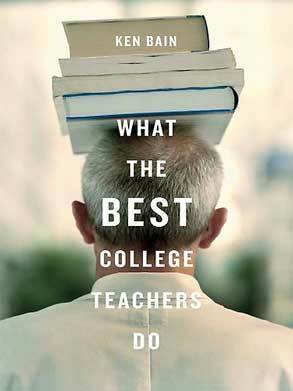 You also want your syllabus to reflect best practices as discuss in McKeachie’s Teaching Tips and What the Best College Teachers Do. That means having student learning outcomes that are connected with student assessment, an explanation of grading, and a variety of teaching and learning strategies. You want your syllabus to convey your organization and your interest in the course and the students. See the UF Resources page for links to other resources on campus that you will want to include in your syllabus. Timeline – The timeline is a planning tool for you and would provide a foundation for developing a lesson plan for each class meeting. You wouldn’t give the timeline to your students. For each class meeting, include the student learning objectives and a brief explanation of what activities you’d include in class, such as presentation, working in teams, a minute paper, watching a video or listening to an audio file, or class discussion. Your overall course should reflect a variety of instructional strategies. I distributed a sample timeline in class. Assessment activity – Develop an assessment activity that would be a significant portion of the students’ grade for the semester. This may be either an exam and answer key OR a major project with a grading rubric. The assignment should reflect best practices from the presentations made by Antionette Rollins and Chris Wilson. Two lesson plans – Select two days (or one three-hour class) and develop lesson plans. The lesson plans should include student learning objectives, how you would begin the class and the class content. Your lesson plan can incorporate bullet points or phrases. The lesson plan should be complete enough that you could teach from it. For examples, if you are going to have a class discussion, you need to list the questions that you would use to guide the discussion. If you are going to have a slide presentation, include a handout of the slides. Select two days where you would have a major role in the class. So do not select a day when you are giving a test, having a guest speaker, or having group presentations. I distributed a sample lesson plan in class. When you bring your materials to class, please organize them in this order and have a large clip, binder or envelope for them. We’ll spent part of class on Monday reviewing classmates’ course packets and discussing the process of curriculum development. Sometimes that’s literal — As a teaching assistant, you are given a syllabus and that’s what you are to follow. Having the syllabus already prepared can save you from making literally dozens of decisions about the course. Sometimes you are given the syllabus to serve as a foundation for the syllabus that you will be developing for the course. You want to be able to develop your own syllabus — recognizing how your course fits into the curriculum and bringing your own strengths to the course. As part of your teaching portfolio, you are developing course materials for an undergraduate communications course — the syllabus, an assessment activity and evaluation criteria, and two lesson plans. Download the form, type in the needed information, and bring the printed proposal to class on Sept. 17. Identify syllabi online for similar courses. Answer the questions (above — in image) about how a syllabus can help your students and help you. Check the links I’ve provided on the blog (UF resources) for information that you will include in your syllabus. 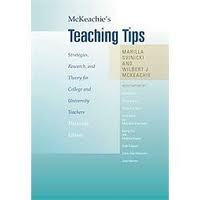 Read the chapter in McKeachie’s Teaching Tips about developing a syllabus. Read a post I wrote about creating a syllabus. 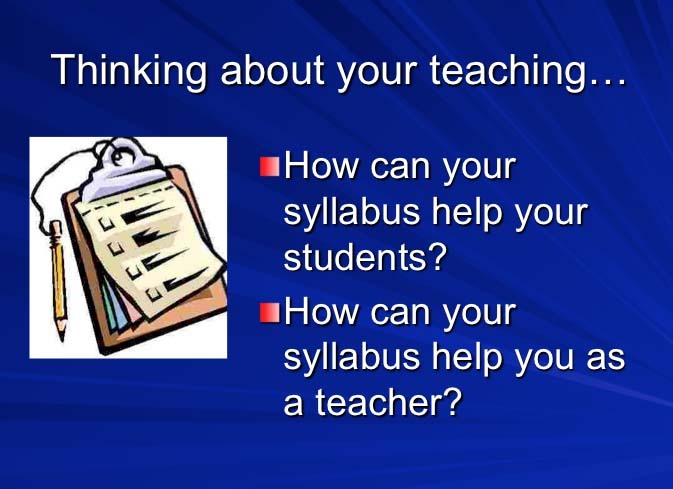 Develop a list of questions you have about creating a syllabus.